← Vintage Santa . . . headin’ into the Christmas Season! One of my favorite “inspiration sites” is the Frilly and Funkie blog (frillyandfunkie.blogspot.com). Their current challenge is called “What a Mesh” … where the challenge is to create a vintage style card using something “mesh”, like burlap, mesh, cheesecloth, tulle, etc. I LOVE the juxtaposition of burlap with frilly lace, etc. . . . so created a card with Graphic 45’s “St. Nicholas” papers. LOVE this Santa! I tea stained some white seam binding ribbon for a “messy bow”, die cut some Tim Holtz Christmas foliage, added some flowers from Petaloo and Prima, and my burlap is topped with some Stampin’ Up lace ribbon and some crushed velvet ribbon that I’ve had for years . . .and have no idea where it came from! Same with the background paper I cut and distressed . . . in my stash for a long time . . .source unknown!! 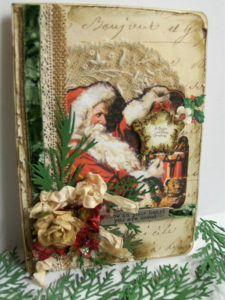 The metal saying is from Tim Holtz, too. Probably my favorite part of the card is the half circle of a lacy doily from my stash of vintage linens. These kinds of touches just MAKE the card, for me! This is my MOST favorite kind of card to make . 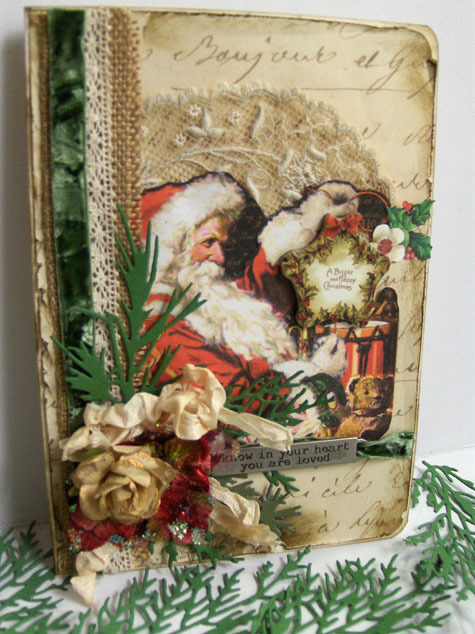 . . one that takes awhile, and is just filled with shabby, vintage details! Enjoy!